Boy, would I like to get behind the wheel of this 600+HP monster. Each year, Vortech builds a custom Mustang for SEMA’s (Specialty Equipment Market Association) annual trade show where the automotive industry’s top manufacturers, distributors, retailers, publishing companies, auto restorers, street-rod builders, restylers, car clubs, and race teams come together to show off their skills with custom creations. 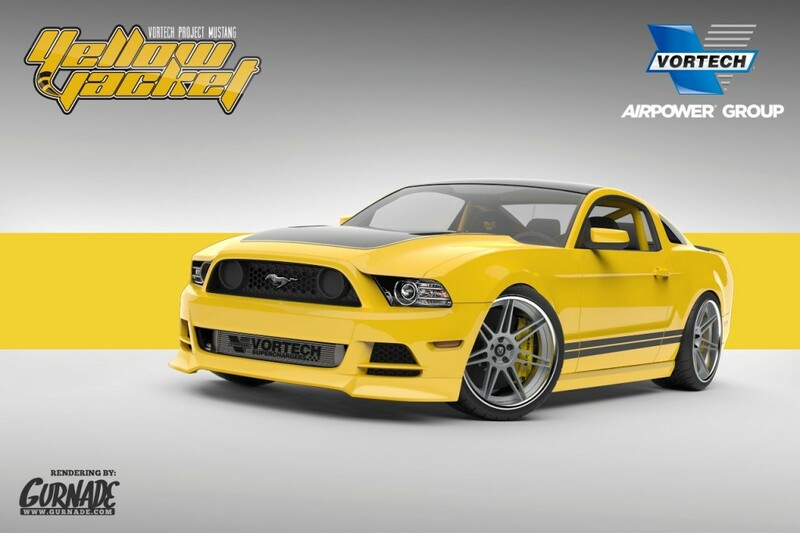 This year, Vortech put together somethnig truly remarkable–noting that Ford doesn’t offer yellow on the 2014 Mustang, Vortech decided they would paint their 2014 Mustang that color. For the 2013 SEMA Show, Vortech went all-out and with the help of AmericanMuscle, built this one-of-a-kind “Yellow Jacket” Mustang that pumps out an impressive 605RWHP and 473 foot-pounds of torque with only 7.5 PSI of boost! AmericanMuscle chipped in a helping hand by providing the good people over at Vortech with a gloss black MMD decklid emblem surround and Roush upper & lower grilles. This 2014 Mustang’s complete list of mods can be found below and if you happen to be at this year’s SEMA show from November 5th-9th at the Las Vegas Convention Center, don’t miss Project Yellow Jacket found at Vortech’s booth! Previous Entry BREAKING NEWS: 2015 Mustang 3D Renderings Based on Leaked CAD Images! Next Entry VIDEO: What is Raxiom Up To? New Mustang Part Launching 11/4! Car sounds nice, should have went with a different name, Yellow Jacket reminds me of the special edition Challengers! !